Ethel Spowers is best known for her modernist colour linocuts produced while she was a student with Claude Flight at the Grosvenor School in London from 1929. Prior to these studies, she had been known as a fantasy artist and children's illustrator, producing colour lino- and wood cuts printed in the Japanese manner. Spowers made only four wood engravings, all while she was in London between 1929 and 1932. Their size and monochromatic appearance contrast with her linocuts of same the period, but share something of their emphasis on repetition, dynamic movement and simplification of form. 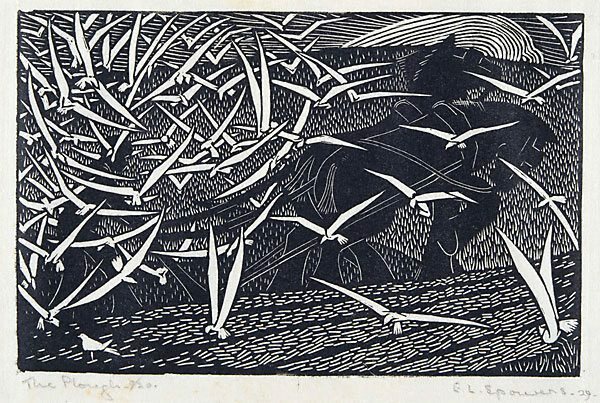 Spowers repeated the composition of 'The plough' three times; in addition to this wood engraving, she made two colour linocuts, 'The plough' 1928 and 'Birds following a plough' 1933. Signed and dated l.r., pencil "E.L. Spowers. 29".